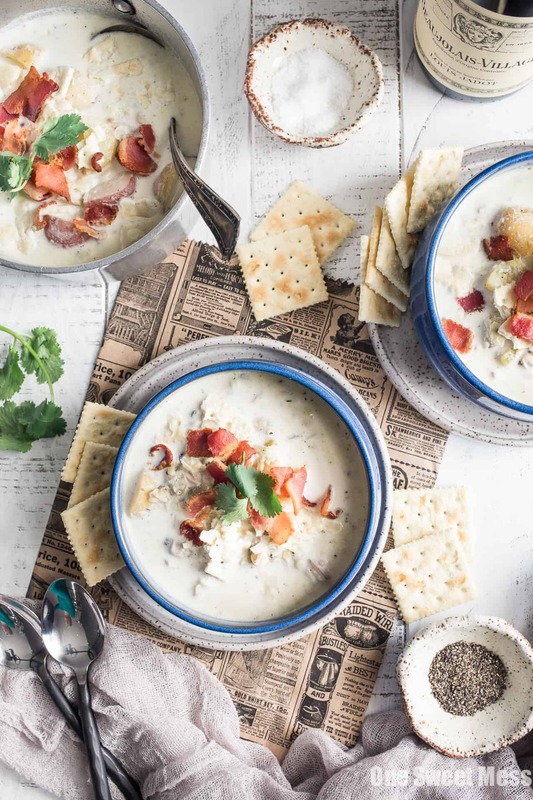 This hearty New England Clam Chowder recipe is a big bowl of comfort! It’s loaded with juicy clams, aromatic leeks, creamy potatoes, and a generous helping of crispy bacon. Last week I shook up a Paloma with the intention of pretending winter was over and I was lounging on the beach of a beautiful tropical island far away rather than stuck in the house watching snow fall outside of my window. 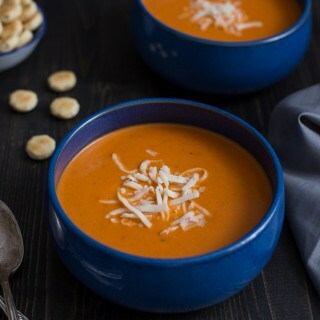 Today I’m giving in to winter and making comfort food–because I’m cold, dammit! In an effort to warm up, I decided to make a huge pot of New England Clam Chowder, and it happens to be gluten-free. It also happens to be damn tasty. The addition of bacon grease definitely helped the cause. The cold weather has turned me into a lazy creature in wool socks, so I opted to use canned clams rather than fresh in this New England Clam Chowder recipe. I’m probably offending the food snobs the world over, but opening two cans is far easier than steaming and picking fresh clams. I think you’ll agree. When you’re cold and hungry, the canned clams look a heck of a lot more appealing. 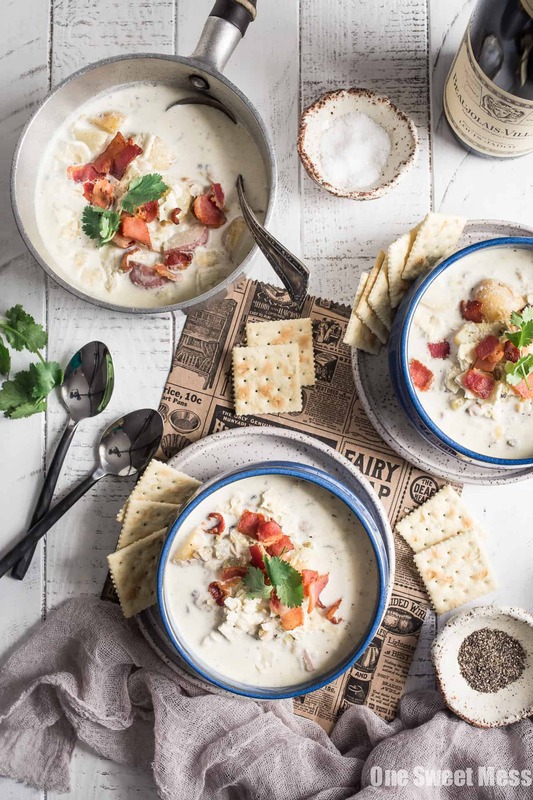 If you’re not into clams but still want to enjoy a cream-based soup, head on over to my recipe for Bacon Beer Cheese Soup with Crispy Potato Croutons or Cheesy Chicken & Veggie Chowder. I’m not kidding when I tell you this soup is delicious. With ingredients like bacon, clams and clam juice, aromatic leeks, and fresh herbs, it’s nearly impossible not to achieve a high level of tasty. This New England Clam Chowder is hearty bowl of creaminess, and it also happens to be gluten-free. I used cornstarch, but you can also use arrow root powder, to thicken the soup rather than conventional all-purpose flour. Thick and dreamy just like the traditional recipe! In a large dutch oven, brown bacon until crispy over medium heat. Transfer to a paper-towel lined plate; set aside. Reserve 2 tablespoons of bacon in the bottom of the pan. Add the butter to the pan with the bacon fat. Once the butter has melted, add the leeks and celery; cook, stirring occasionally, until tender, about 4-5 minutes. Add the garlic and cook an additional 1-2 minutes until fragrant, stirring often. Add the wine and reduce by half, about 1-2 minutes. Add the potatoes, clam juice, chicken stock, bay leaves, Italian seasoning, and a generous pinch of kosher salt and pepper. Cover the pot, leaving a small opening and cook until the potatoes are tender, about 10-15 minutes. Once the potatoes are fork tender, stir in the clams. Add cornstarch to a measuring cup with the heavy cream and whisk to combine. Add the heavy cream mixture to the pot. Allow the soup to gently bubble uncovered for 10 minutes to allow the soup to thicken. Season with salt and pepper to taste. Garnish with bacon and chopped parsley. Serve with your favorite crackers.